Social media is an integral part of our life. It makes us social virtually and of course, there is no single right way to get social. Digital technology gives us the chance to be present, online, active in multiple places at the same time. It is believed that there are about 2.216 billion active social media users across the globe. Social media also gives us the opportunity to choose, which social platform we want to be social and when. So, comes in the concept of multiple accounts in social media and a reason for managing the same. Different social media accounts can be on the basis of preference, need or application. Multiple social media accounts can be accessed from different devices as well. Facebook has always been one of the most popular social media accounts. Facebook tops the list in terms of active user in millions in 2015, followed by Whatsapp and others. People have multiple social media accounts to be able to cater to different requirements. For examples, being ‘social’ among friends and family needs a Facebook account; messaging needs a Whatsapp account, professional network needs a LinkedIn account, daily updates need a Twitter account, image repository and shares need Pinterest or Instagram accounts, bloggers have their own domain accounts and so on. Not everyone will need all the accounts. The number and type varies from user to user. But, if you happen to keep multiple social media accounts, you need a management tool to maintain and keep track of them. A social media dashboard is like a website or a program, which helps you to manage all profiles in one place. You don’t have to login separately to individual accounts, rather post updates, shares, messages etc. from one place. It was founded in 2008 and first integrated with Twitter. Gradually, it incorporated others like Facebook, Google+, LinkedIn and others. There are two plans – Free and Pro. They differ in the features they offer like reports and team members. Currently, it is rated as the No. 1 social media management tool in terms of market share and social presence. They have an app directory, which lets you extend the number of apps and also the most affordable basic plan. This started in 2011 and slowly gaining popularity. It also integrates the major social media accounts with full access to reports and allows unlimited team members. The backend operation handles engagements effectively, and allows you to build Facebook apps. It scores high on customer satisfaction, customer support, and product direction. This has the second largest market share after HootSuite. Though it’s a bit expensive, but it has a popular and growing user base since it was founded in 2010. It gives full access to reports and analytics. Users have marked it high on ease to learn and usability. It integrates Twitter, Facebook, Instagram, LinkedIn and Google+. This was started in 2009 and integrates a large number of networks. Here, the plans are based on ‘number of services’ rather than number of networks. It has been rated 2nd in product direction and meeting requirements. It comes 3rd in terms of ease to learn and usability. It has one of the most expensive base plans. Some of the other alternatives listed by them are MavSocial, Oktopost, Jollor Meshfire and Rignite among others. 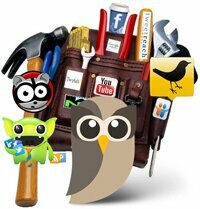 Social media management tools are used by both social media managers and regular users. There are many tools in the market, so choosing the right one(s) might be tedious, but keep in mind your requirement before selecting. Social media analysis is a complicated mechanism, so choose a tool, which is easy to use and interpret, according to your need. Though, these are automated tool, they still need a bit of human touch to manage and use the results effectively. So, if you have multiple social media accounts and finding it difficult to manage them, then it is time to adopt one or more social media management tool(s) to make the best of your social media presence.